The acid base balance is vital for normal bodily functions. When this equilibrium is disrupted, it can lead to severe symptoms such as arrhythmias and seizures. Therefore, this balance is tightly regulated. In this article, we will look at the buffering system, responses of the urinary system and relevant clinical conditions. Information on the buffering system of the blood and responses of the respiratory system can be found here. The urinary system utilises two methods to alter blood pH. That is, excretion of hydrogen ions as dihydrogen phosphate or ammonia and reabsorption and production of bicarbonate ions. Excretion of hydrogen ion in the form of dihydrogen phosphate (H2PO4–) – hydrogen ions are actively transported into the lumen via hydrogen-ATPase pumps on alpha intercalated cells. Excess luminal phosphate (only 85% of total phosphate is normally reabsorbed) can bind a large portion of hydrogen ions, buffering them as dihydrogen phosphate before excretion. This excretion of hydrogen ions increases blood pH. Excretion of hydrogen ions in the form of ammonium (NH4+) – glutamine is converted to glutamate and ammonium in the proximal convoluted tubule (PCT). The ammonium dissociates to ammonia and hydrogen ions, allowing it to pass the membrane and enter the lumen. Once in the lumen, it reforms ammonium by picking up a luminal hydrogen ion, allowing hydrogen to be excreted as ammonia, increasing blood pH. Furthermore, ammonia secreted at the PCT can be used to buffer and excrete hydrogen ions secreted further down the nephron by alpha intercalated cells of the collecting duct. This is due to its ability to pass membranes and traverse the nephron. NB: The glutamate created from glutamine can also go on to form bicarbonate (via its conversion to alpha-ketoglutarate) which can then be reabsorbed to further increase pH. Bicarbonate ions can also be reabsorbed in the kidneys which aid in the buffering system. Reabsorption takes place in the PCT. Hydrogen ions are secreted into the lumen via the Sodium-Hydrogen exchanger to combine with any filtered bicarbonate. This then forms carbonic acid (H2CO3), catalysed by carbonic anhydrase on the luminal side. Carbonic acid then dissociates into carbon dioxide and water, which both can diffuse into the cell. Here, the reaction is undone, and carbonic anhydrase inside the cell converts carbon dioxide and water to carbonic acid, which then dissociates into hydrogen ions and bicarbonate. Bicarbonate can then be transported into the blood whilst the hydrogen ions can be transported back into the lumen for the cycle to repeat. Fig 1 – Diagram showing reabsorption of bicarbonate within the kidney. The kidney is also able to produce bicarbonate. The metabolic activity of cells produces large amounts of carbon dioxide, which can then react with water to produce bicarbonate ions, which enter the plasma, and hydrogen ions to be transported into the lumen. This is useful as it also provides hydrogen ions to drive bicarbonate reabsorption. In addition to this bicarbonate can also be produced from amino acids, which produces NH4– ions which then enter the urine. Respiratory acidosis is where there is an increase of carbon dioxide in the blood, the cause of which is due to a disorder in the respiratory system. Common causes include respiratory depression by opiates, disorders of the respiratory muscles such as in polio and airway obstructions such as in sleep apnoea. The buffering systems are overwhelmed and pH drops. Therefore, the kidneys have to excrete more hydrogen ions via the two methods previously discussed in addition to an increase in bicarbonate reabsorption. Respiratory alkalosis is associated with hyperventilation, which can occur due to hypoxaemia from high altitudes or a pulmonary embolus. The compensatory methods for respiratory alkalosis is the opposite of respiratory acidosis: due to the high levels of bicarbonate, hydrogen ions are reabsorbed to attempt to bring the pH down by decreasing hydrogen excretion and decreasing bicarbonate reabsorption and production. Which cells in the kidney tubules are responsible for the excretion of hydrogen ions? 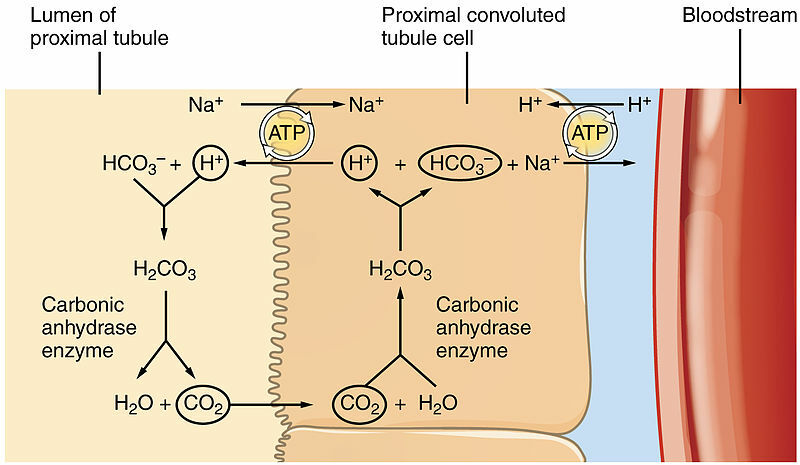 Which cells in the kidney tubules are responsible for the reabsorption of bicarbonate ions?